The Ichthus, from the Greek word for fish, is a simple sign of a fish made with two intersecting arcs, that was used by early Christians as a secret Christian symbol to identify each other. Greek was used, as Koine Greek was the language of the common people during that time, and the language that most of the New Testament was written in. From the earliest days of the Christian church, starting in the Biblical book of Acts, those who choose to believe in the promised Messiah, Jesus, have been persecuted by those in power. Karen and I are happy to be identified as Christians and thankful that we live in a country where we can worship Jesus Christ openly. We understand that many of our Christian brothers and sisters around the world do not have that privilege and in many countries are still persecuted for their faith. 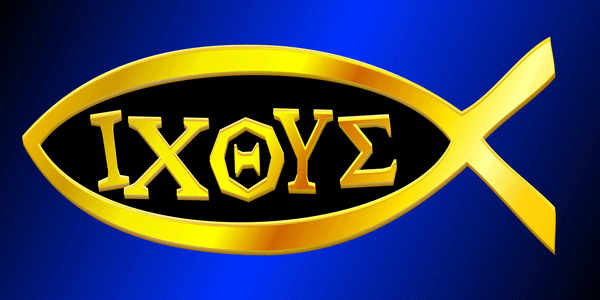 The Ichthus usually appears as a simple outline but often includes the acrostic/ acronym ΙΧΘΥΣ for "Ίησοῦς Χριστός, Θεοῦ Υἱός, Σωτήρ," which translates into English as "Jesus Christ, Son of God, Saviour." If you would like to know more about what the Bible says about being a Christian please click here.